I walked into my first open mic three years ago. I was late so the mc brought me a chair. I had no idea that this little coffee shop would become my home for the next three years. That on the stage, my broken would look a lot like magic. That my words, would mean something to someone. You have no idea what you are writing, it just comes. And then you stand on a stage for three minutes and bleed. It’s the slowest three minute drowning you’ll ever feel. There is no formula. You die on paper and resurrect on a microphone. It’s all instinctual. And every poet knows what it feels like to hear something so insanely good that it feels like a bullet through glass. I think rock and roll started on an open mic. 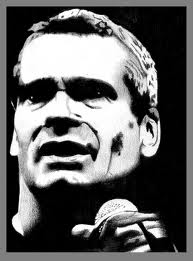 Ask Henry Rollins. Spoken word is a demolition. Sometimes you have to dynamite down to the foundation to find the good stuff. But when you do, you start building a new church.